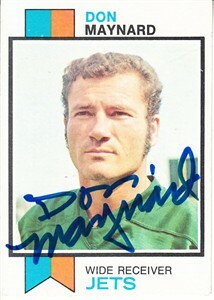 1973 Topps football card #175 autographed in blue Sharpie by New York Jets Hall of Fame receiver Don Maynard, who was Joe Namath's favorite target. Obtained in person, with certificate of authenticity from AutographsForSale.com. NOTE: card has two moderate surface creases on front. ONLY ONE AVAILABLE FOR SALE.